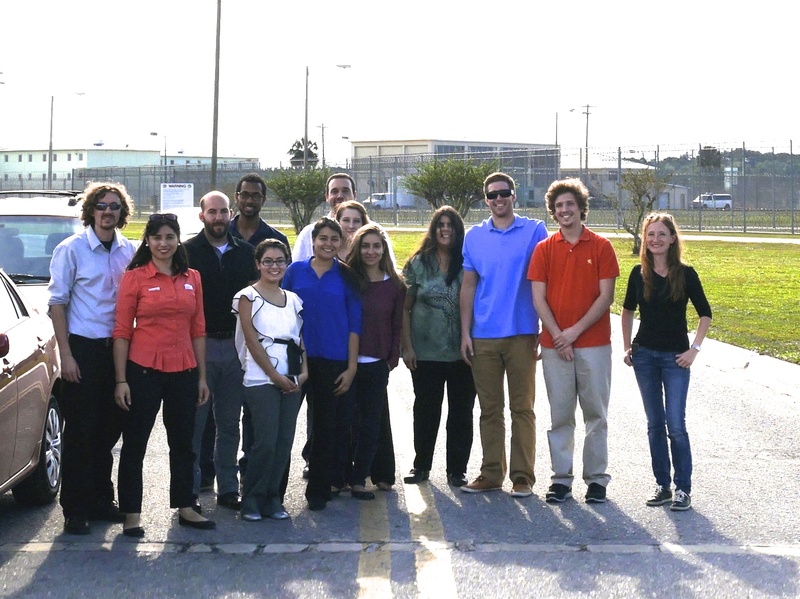 This semester I took students in my Law and Order in the Americas seminar on a tour to the Florida State Prison in Raiford. FSP is one of the largest prisons in the state and it houses inmates in close management and maximum management wings––all solitary confinement cells. The state’s execution chamber, where legal injections are performed and where the electric chair is still an option, is also located in the facility. I first went on a tour to FSP two years ago, when I began teaching this course as a new assistant professor at the University of Florida. I sought ways to show the seminar’s graduate and undergraduate participants that the theoretical issues we were addressing – such as, the operation of power and the routine functioning of social control through panopticism – were relevant beyond our classroom. FSP provides regular bi-weekly tours of the facility, so I decided it was worthwhile to include this excursion into the course curriculum. The tour to the state prison has since become a quintessential, even if difficult, learning experience for my students (and for myself). Weeks before the tour we have to go through the background check and we receive guidelines about the dress code on prison grounds, which builds up anticipation and anxiety. On the scheduled day we drive about an hour north of campus to reach the facility, where we go through rigorous a security check to enter the prison. A lieutenant, who has decades of experience at FSP, narrates us the life inside of the institution: from demonstrating makeshift weapons they confiscate from inmates to explaining the hour-by-hour and minute-by-minute schedule of the execution. We walk through alphabetically named cellblocks, where inmates are locked in solitary confinement, and we end the tour on death row. There, students are allowed to ask the death row inmates questions – an invitation that perplexes them. Some are disturbed, others fascinated. After the trip we talk about what we saw during the visit in class and it becomes a recurring reference in our discussions for the remainder of the semester. I also ask students to write short reflection essays – the more personal, informal accounts of their experience. As I am reading their essays now, I see how challenging this tour is to my class. Students grapple with questions of criminal justice and their position on death penalty, they focus on the silences and the eerie sounds of the prison, they describe their discomfort of being the observers in what many liken to a human zoo. To me, as the instructor of the course, the most important lesson is that the same activity – this guided and highly choreographed tour of the prison – has radically different repercussions on my students. Their experiences are refracted by their personal backgrounds and family histories, their political ideologies and activist aspirations. Both before and after the excursion I emphasize that the focus of the visit will be on the prison as an institution and on corrections officers that run it rather than on the inmates – except for several men on the death row, we don’t interact with any prisoners. I ask them to use their training as anthropologists to see the facility from the perspective of corrections officers, to notice the categories they use, their verbal and body language. Those students who can shift their perspective from horror and empathy with the inmates to thinking about the everyday life of the corrections officers come back with a much better understanding of the grey areas of violence and the marginal subjects of the carceral regime. In their essays they write about domestic violence in corrections officers’ families (the prison walls are decorated with posters raising awareness about the issue), about the societal stigma of convicts’ spouses and children (whom we pass on the way in or out of the gate). Others, blending their eye-opening experience on the tour with concepts and theories discussed in class, speak out even more persuasively against existing policies of crime punishment in the U.S., expressing their activist determination to change them. However, the rest – and quite many – convey in their essays that they need more time – months, even years perhaps – to wrap their minds around what they saw and to understand how they feel and what they think about it. Now the semester is over. I may not see some of my students again, but I am sure that the impact of this experience will stay with them and that this class taught them something valuable. Instead of providing answers, the tour raised questions, stirring the uncomfortable edges of the popular debates on the politics and ethics of law and order. Reblogged this on ieva jusionyte.